During my last visit to Ipoh, the tour guide brought us to a shop opposite Ling Sen Tong Temple [if I am not wrong] to buy some local products. Someone said that the chilli taucheo is good and may not be available in other states. As I wasn’t keen on buying anything in particular, I simply chose a bottle of the Chilli Taucheo. 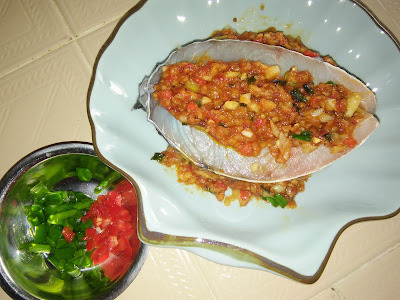 This Chilli Taucheo is quite similar to Dao Ban Jiang but it is not that salty but it has some sugar in it. 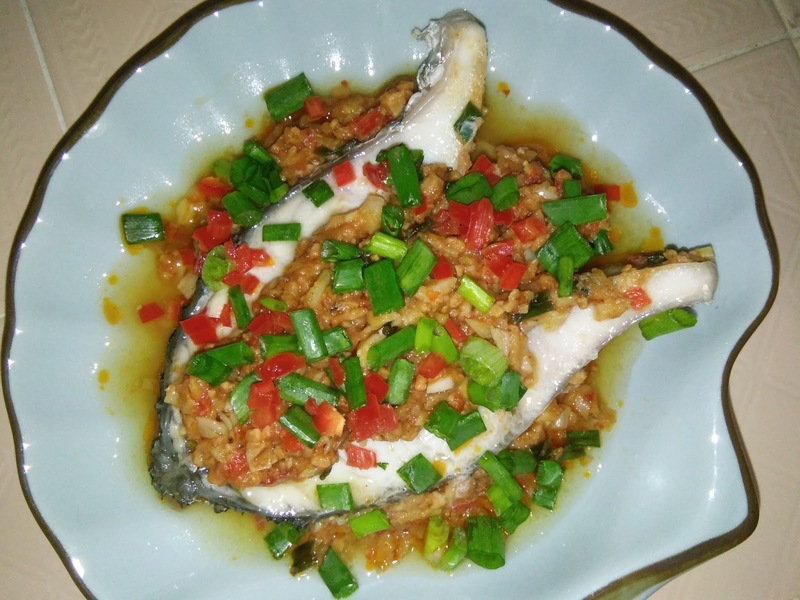 For this steamed fish dish, I use it for the steaming sauce and it turns out great. 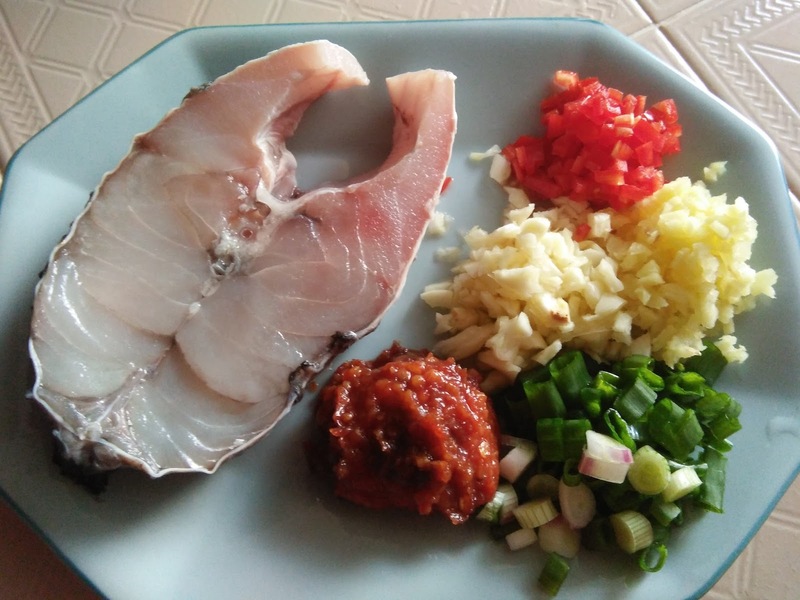 It is so simple and easy to prepare yet the result is awesome. 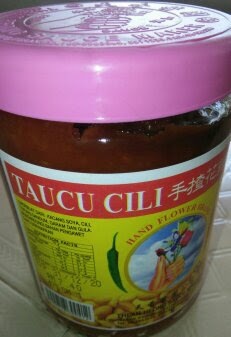 This sauce is also good for steaming prawns, clams or to stir fry tofu puffs which I will definitely try. 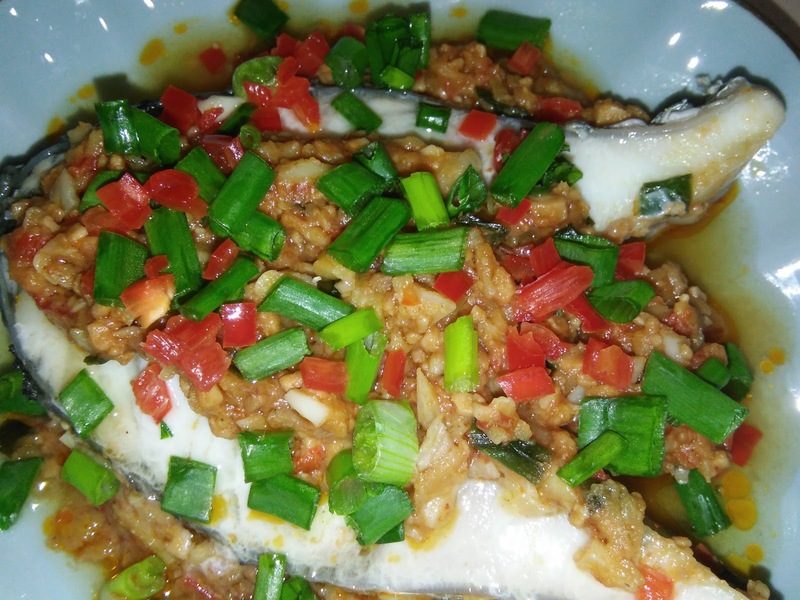 Lovely steamed fish block and looks so presentable and tempting. Place fish block on steaming plate. 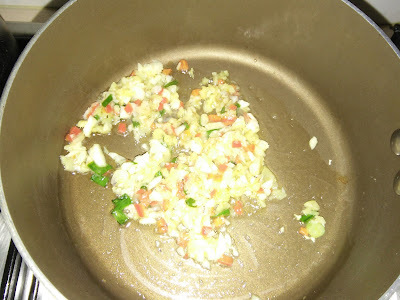 Heat both oils in a small pot/pan, sauté chopped garlic, ginger and some chopped chilli and spring onions until fragrant. Add in chilli taucheo. Stir to mix well. Off heat. Spread fried steaming sauce over fish and steamed for 10 minutes or more [depends on size of fish]. 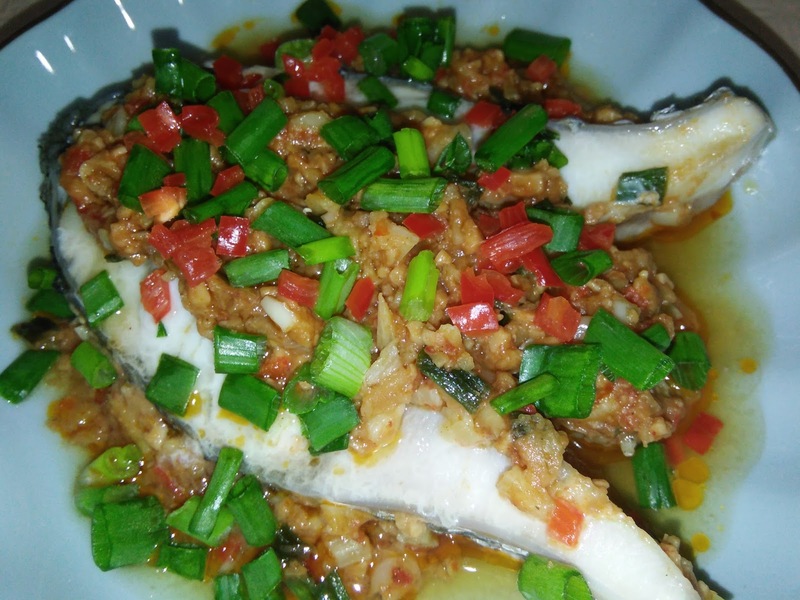 Remove from steamer, sprinkle balance chopped red chillies and spring onions over steamed fish. Hi Kimmy! 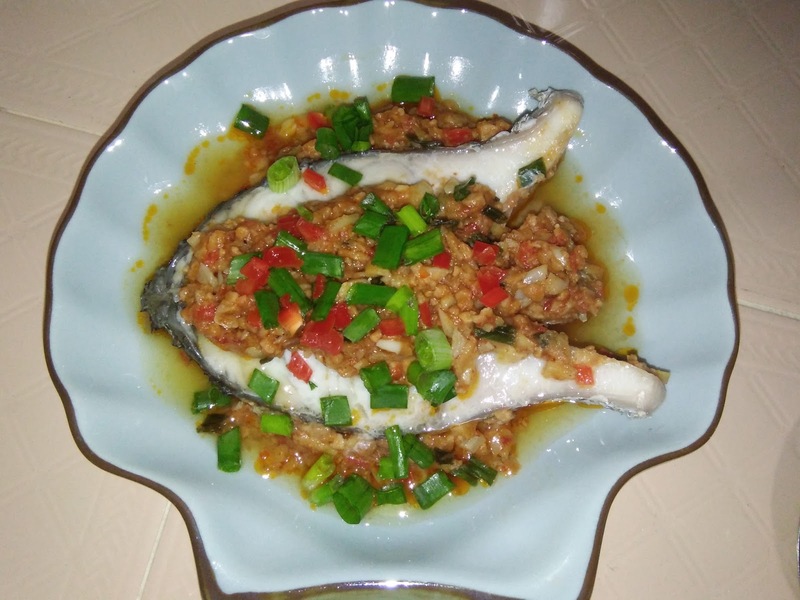 I like your steamed fish especially since you are very generous with the topping. I can simply wallop a big bowl of rice with this yummy steamed fish chili taucheo sauce. It look so attractive ! I would like to wish you and family Happy and Prosperous CNY! Hi Aunty Young, Happy Chinese New Year greetings to you too. Sorry, I have been really busy before and after CNY. 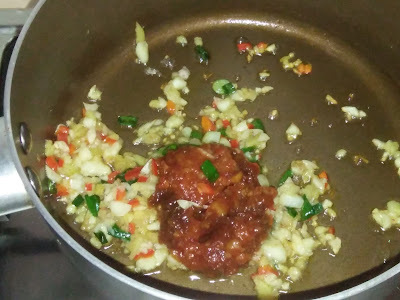 Only started to try out new recipes after I came back from my in-law's place. Fully agree, I can finished this whole piece myself especially when it is right out of the steamer. This bottle of chilli taucheo is good. Better than dao ban jiang. I will take a picture of it and post it here.